How does MTConnect compare to other protocols? Below is some free MTConnect information. You may also request information from us! Can you compare MTConnect to other protocols? As a refresher – MTConnect enables manufacturing equipment to provide data in structured XML rather than proprietary formats. OPC UA – MTConnect is more suited for equipment with standardized functions, such as CNC controls or other equipment that has known capability. How does it compare to OPC UA? ModBus – TCP/IP protocol via a messaging structure developed in 1979. Can transfer discrete/analog I/O and register data between control devices. It supports MTConnect’s standard communication protocol. MTConnect is a standard for formatting and transmitting data produced by manufacturing equipment. This data can then be processed by software applications. Common uses for this technology are real-time machine monitoring, historical reporting using charts, graphs, and other visual representations of a shop’s performance. The protocol enables more attainable and less cost-prohibitive manufacturing productivity. 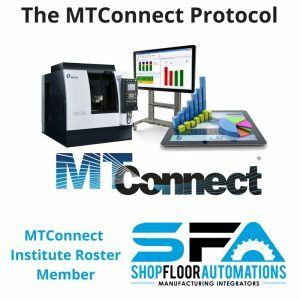 How is Shop Floor Automations (SFA) qualified to answer MTConnect questions? SFA is an MTConnect Institute Roster Member and we have been providing free insight on the protocol for quite a few years now. Our MTConnect compatible best-sellers are DataXchange and Predator MDC.